Have you ever participated in a Quilt a Long? 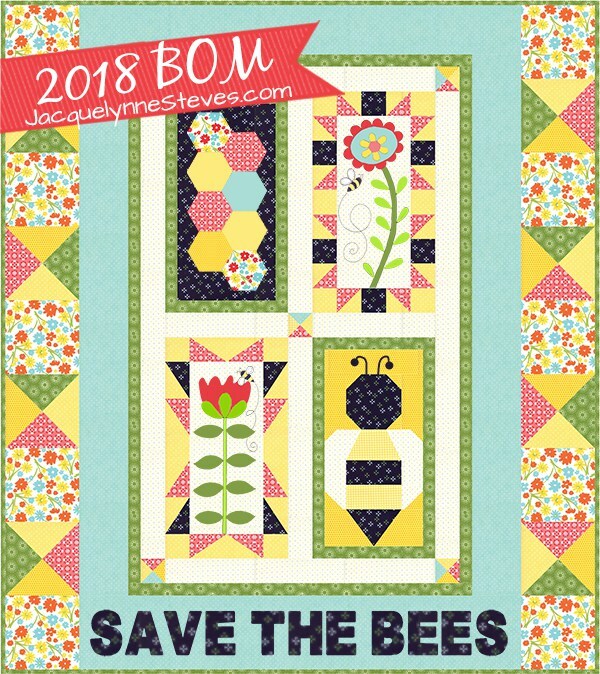 I’m so excited to be participating in a couple this year and today I get to share with you this fun Quilt A Long hosted by the super talented Jacquelynne Steves for this Save the Bees Quilt! Isn’t it darling? I’ve been doing some research about starting to raise my own bees so when Jacquelynne contact me about the Quilt Along I was so excited! 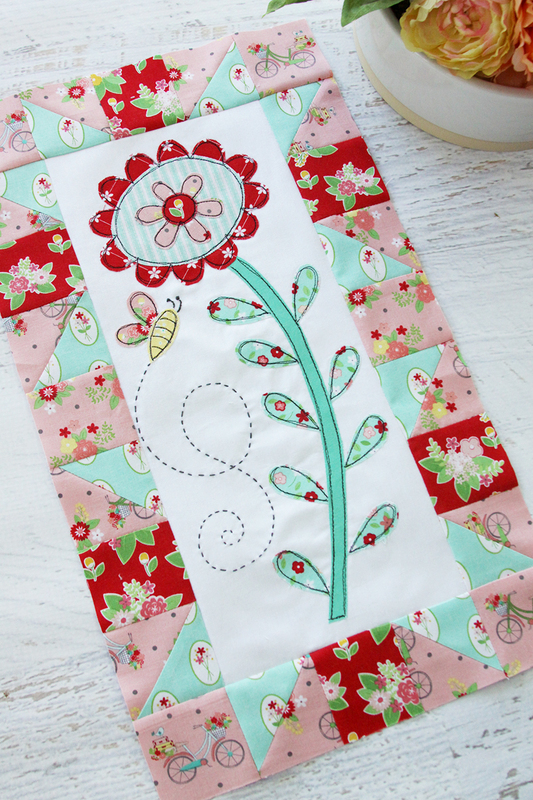 The Quilt pattern is free at Jacquelynne’s blog – you can click here to get all the info. 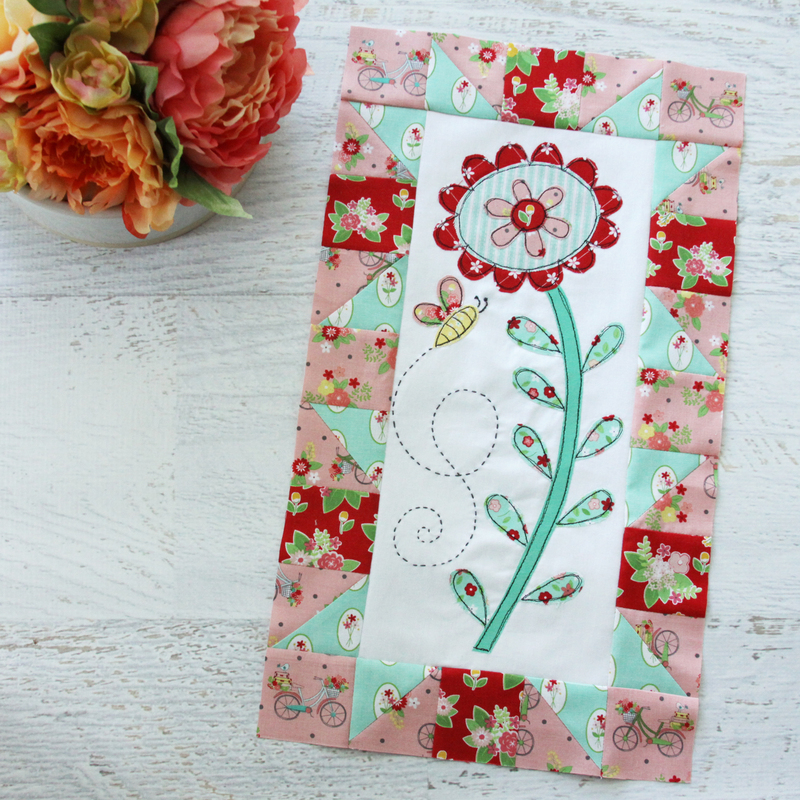 Every month there are several bloggers who will be sharing their own versions of the quilt blocks – here is mine! I created my version of the block with Vintage Adventure fabrics. If you’re visiting for the first time, Vintage Adventure is my first fabric line with Riley Blake Designs. I love how it worked with this fun flower and bee block! For my block, I did a combination of hand and machine embroidery. The hand embroidery is a simple running stitch done with three strands of gray floss for the path of the bee. I outlined the flower and other details with a free motion foot on my machine and Aurifil 50wt Black thread. Since I don’t have any yellow in my fabric line, I used a little piece from Bunnies and Blossoms by Lauren Nash for Riley Blake Designs. It blends great with Vintage Adventure! We will all also be hosting giveaways every month! Each blogger will be hosting their own giveaway for the item so you can hop over and visit everyone and enter. This month the giveaway is for the amazing Sew Sampler book!! ***** The Giveaway is Now Closed***** Thanks for entering! The giveaway is open worldwide – if the winner is in the US they will receive a hard copy of the book and if they are an international winner they will receive a digital copy of the book. ***** The Giveaway is Now Closed***** Thanks for entering! To Enter the giveaway here: Leave a comment on this post by scrolling down to the bottom of the post to the section titled Leave a Reply. You can then enter your comment. 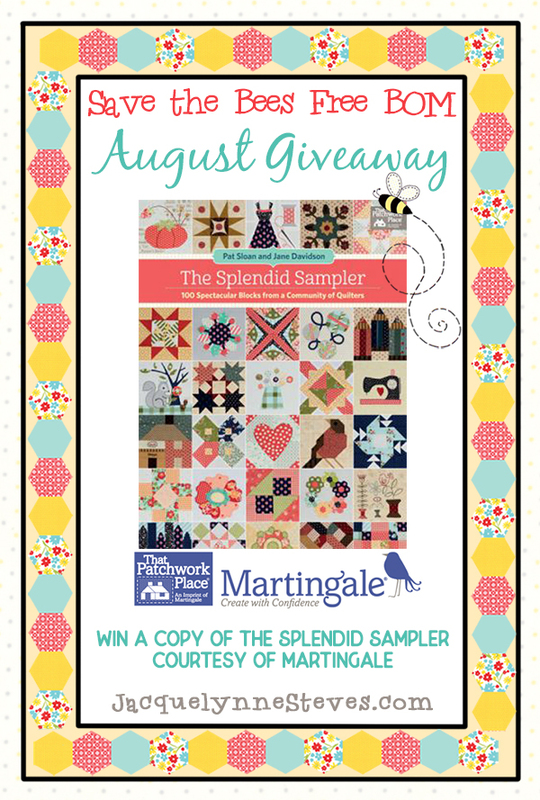 To enter to win a copy of Sew Sampler courtesy of Martingale, leave a comment answering this question – have you ever done a quilt along? If you did – what did you make? We will close the giveaway on Sunday August 12. To sew along with us, head over to visit Jacquelynne Steves to get the pattern and all the information! It’s definitely not too late to sew along with us. We’ll be posting new blocks every month so you have plenty of time to sew too! 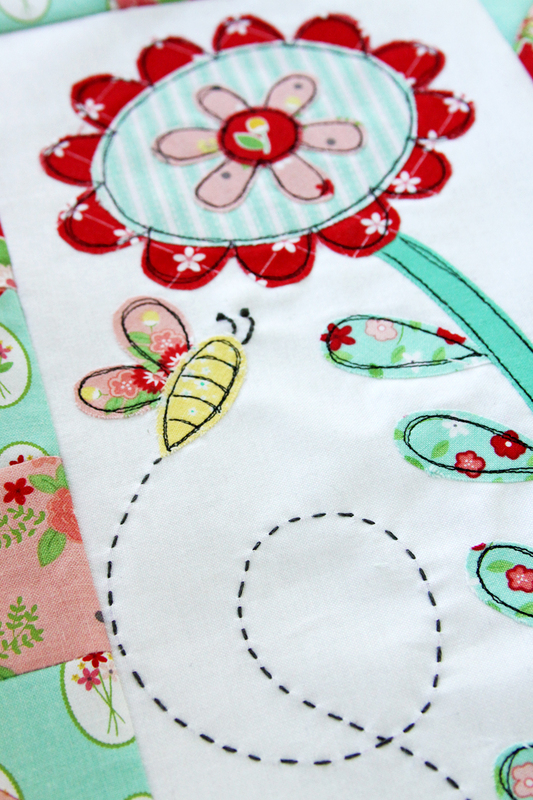 We’d love for you to share photos of your quilt blocks in the Save the Bees Facebook group too! This is my first BOM & so excited that it has to do with bees! I’m looking forward to seeing all the posts & pics of the other members using their choice of fabrics!! I have not participated in a quilt along before. This one looks like a fun one. I did the BOM “I Love Home” last year. I really enjoyed it. IVE done a block of month before, but never a quilt a long, so this is my first , and super excited to start this darling block for thi she month. This is my first BOM and I am very excited to start mine. the bad part is that I have to work today and can’t get started till later this evening. Sorry 2nd, I forgot the Merry and Bright one i Started 2 weeks ago. Many quilts going on at one time. I’ve never done a quilt-along before, so I am really looking forward to doing the Save The Bees one. I did a block-a-month quilt class, which was just lecture and demo, then we were to finish the blocks on our own at home. I’ve finished three of the twelve block so far. The class ended a couple of years ago! This is my first online BOM. Not sure that I can keep up but I’ll try. It’s cute! I’ve done BOM through my local quilt shop. Have saved blocks from a few on line. Hopefully will stay caught up with this one! Does a mystery quilt done at a weekend retreat count? We did Lori Holt’s SPRING quilt. Excited about this BOM. This is my first BOM – I’m excited to start! Thanks for sharing. Yes, I did The Splendid Sampler & Jacqueline’s I Love Home . I just completed the MODA Choose Your Own Adventure QAL – it was the first one I followed and posted on instagram. It just finished today and I loved participating. We are beekeepers (14 colonies) and love all things ‘bee’! I was so excited for the timing of this QAL. I have not participated in a quilt along as yet. I definitely consider my a very timid beginner, but so have the desire to get better at every attempt. I love, love , love looking at all the ways people come up with their versions. It is amazing to me. I have tried before with the best of intentions. This will be my first. Life just kept getting in the way. This is to sweet, so I must get it done. I have finished one BOM that was a sampler quilt and started another one. This one will move to the front as I want to use it as a gift. It’s a great way to learn new methods. I have done a quilt along a very long time ago and I’m still using the quilt I made. I’ve loved it to shreds and it’s time for a new one. That’s why I’m so excited about this quilt along! I have never done a quilt-along. Really excited for this one. We are beekeepers, so this one really grabbed me. Thanks for your blog. I have started a few quilt alongside but have never completed one. This one I will finish! I am still trying to determine my favorite but I like blanket stitch on the more whimsical items by hand or machine. I have also done satin stitch by machine. I have never done needle turn by hand but I want to try it on this BOM. I just started my first quilt-a-long in June with the Splendid Sampler II. 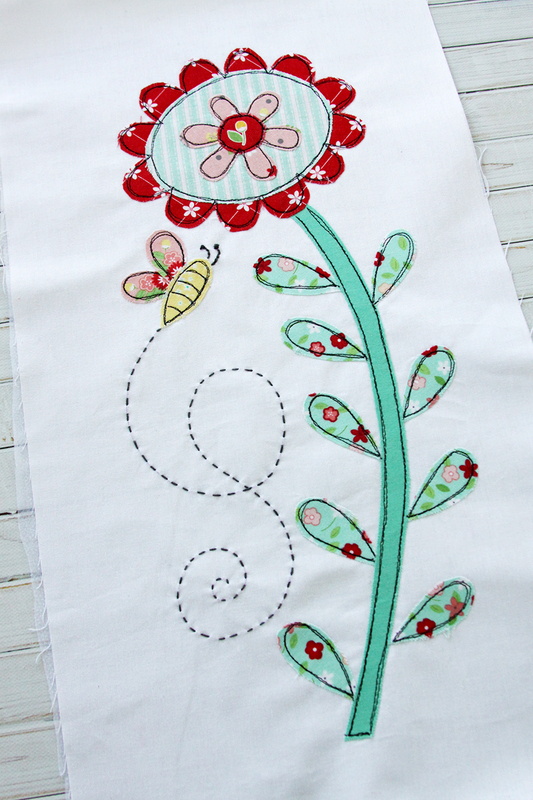 I love this bee themed quilt so I am going to have to do this one too! I’ve done 2 local quilt alongs but this one is too cute. Can’t wait to see your block! I love this pattern! I will be anxious to see your block, I have liked all of them so far!! I need to pick out my colors and get started too. This will be my first quilt along, and I’m super excited about it!! YAY!! This is the first quilt along that I have committed (to myself) that I will complete. Life gets in the way! There is just something about this quilt that makes me determined. Thanks. I have done a few quilt alongs by Jacquelynne Steves and Pat Sloan. Yes, I’ve done several quiltalongs. They are all so much fun and keep you on track! Mostly large lap-size quilts. I’ve never done a quilt along. THANKS FOR SHARING ! This is my first quilt along. I’ve looked at several: but, have not started any. This will be my second one to start this summer. I have each BOM in a separate container so I can keep them straight. This is the first quilt along I have done and I am excited to be involved. This is my first sew along. I have done BOM’s and row quilts with my guild and Beehive. I have followed a few quilt alongs but not actually made the projects. I am looking forward to trying this one. So many options are fun to see. Thank you. I’ve joined several blocks of the month, but I’ve never done a quilt along before. I have never done a quilt along. I have done a Quilt a long by Lisa Bonegean called Triangle Gatherings. I have finished all of the blocks but not put together in a quilt yet. I started the I Love Home BOM but my sewing machine died, so I had to wait months to get another. I am doing my first bom ever, enjoying that the fabrics are chosen for you and having one block commitment/month, makes it fun to do. I have completed a throw-size quilt in a Quilt Along last year. Thank you. My most recent quilt a long was the Crafty Quilter’s Summer Fun. Enjoyed it! Thanks for offering the book as a prize this month. Love seeing the pictures of the blocks so far. Yes, in 2016 I did the “Long Time Gone” Sew Along with Knome Angel. I did a quilt along called Women of the Bible. I am looking forward to this BOM. I just put together 12 blocks I did last year. Such a great feeling to see how much I improved with the completion of every block. We did a Round Robin and that was a lot of fun at my Local Shop. Thanks for being a part of this one! I am excited to do this quilt along it is my first one and there are so many good ideas. Thanks for the blog. My first Quilt a long / BOM was a free one on Craftsy — Alas, it is in the UFO pile! I have done a few of Jacquelynne quilt alongside & took a quilting class doing a quilt along. Yes I have done sew a long….J. Stevens last two. This one looks like fun too! I have never done a quilt-along. Looking forward to this one! Love your block, and thanks for your blog! I have done a couple of sew a longs and have enjoyed them. You always learn something new. This is my first Block of the month/guilt along journey! I am so excited that it is a “Save the Bees” project! I am excited to see what everyone comes up with. I have tried to do a quilt along but I always seem to get behind and then I give up. This quilt along is small and should be very doable. I’ve very excited to start block 1. I just finished sewing the rows together for Pat Sloan’s “In The Summertime BOW” Now I have to quilt and bind it. I made all the blocks for the Splendid Sampler 2016 , but still have to sew them all together, which I hope to finish this month. I am totally addicted to quiltalongs of all kinds! I always have several on the go! I have never done a quilt along. I can’t wait to get started. No, I have not done a quilt along before. This is fun. Thanks. I am participating in the National Quilt Museum Block of the month. I am finding, I really enjoy the quilt- along but will need to stick to the winter months – our summers are just to crazy to keep up with any amount of quilting. I have done one other quilt along and I am looking forward to this one. En Provence, a mystery by Bonnie Hunter. I have done several quilt along’s. I like them because it’s inspiring to see how other quilters fabrics display a totally different look to the given quilt pattern. Makes me less afraid to think out of the box for fabric choices. In several FB groups now working on a couple of primitive quilt along’s. I’ve never finished one unfortunately. Gotten 3-5 blocks in and that’s where I stop. Don’t know why, it just happens. This one looks very quick and easy, I think I should be fine. One can only hope! I did a quilt along at the local sewing store a few years ago. It was afghan size and each block had a flower using different techniques. It was a real learning experience. It was a lot of fun to work on and to see what the others in the class did with theirs. If a mystery quilt is considered a quilt a long, then yes I’ve done one. I’ve done the first two blocks of a quilt a long but I haven’t finished one. I made Maggie’s First Dance also by Jacquelynne, and Pat Sloan’s Grandma’s Kitchen. I love all of Jacquelynne Steves’ patterns/projects!! The quilt-alongs are such a great learning opportunity. This is my first Quilt Along!!! Very excited! I’ve done two Bonnie Hunter on line mystery quilts, and several mysteries thru my local quilt shop. It’s such fun to see how other quilters are interpreting the blocks! I made a Carpenter’s Star wall hanging in a quilt along a few years ago. I participated in the first Splendid Sampler, 2 Project Linus fundraisers and one with the Sewing Loft. I love seeing how we all interpret the designs and the fabric we use! I have made 3of the Lori Holt quilts. This is the first and I hope not the last. I’ve never done a quilt along. I made a Christmas Mystery QAL with Fort Worth Fabric Studio last year. It was fun. I also started the Star Spangle Mystery QAL with Fort Worth Fabric Studio this year but I haven’t finished it yet. Can’t wait to do this one! I have not done a quilt along. Sounds like fun. This is my 2nd quilt along. I’ve been in another murder mystery quilt BOM group since January. Lots of fun! I’ve done several quiltalongs, ending up with one lap size quilt and some UFOS! I’m working on a couple of online BOM clubs and I have completed one of Bonnie Hunter mystery quilts. No, this is my first! I did start one earlier this year. It was paper piecing and enjoyed the first block but because each block was from different designers the following blocks did not inspire me so I gave up. I prefer this quiltalong, Save the Bees, where it will be on the one theme so determined to do this one. Thanks for the entry. I’ve never done a quilt along before this one! Had all my fabric pulled last week and will cut all my pieces tomorrow! Last year I did the Whipstitch Murder Mystery Quilt. Each month we got a block to complete and a chapter of a mystery. At the end of the year we had a complete quilt top and a solved mystery with clues in the book and the quilt. Very fun! I have never done a quilt along. I have followed a few, but haven’t been able to begin one yet. I have made quilts and wall hangings during sew a longs. I have never done a BOM but I’m very excited about this one. Cut all my fabric this morning! Everyone’s block is so pretty and unique can’t wait to see yours. I have done variations or segments of BOM, but never the entire quilting project. I have a hard time keeping up with quilting class projects and the extras too. I wish there were more hours in the day. I’ve done many BOM and Mystery quilt alongs. I have done everyone of Bonnie Hunter’s mystery quilts and a few of Pat Sloan’s projects. Oh my gosh-I love quilt alongs! I’ve done Jacqueline’s for the last 3 years and I donate it to a fundraiser for one of the kids at the special needs school where I work. I learned this year that the same woman has won the last 3 quilts and she gives them to her granddaughter! I saw a picture of the granddaughter with her 3 quilts and can’t pick which one is her favorite. 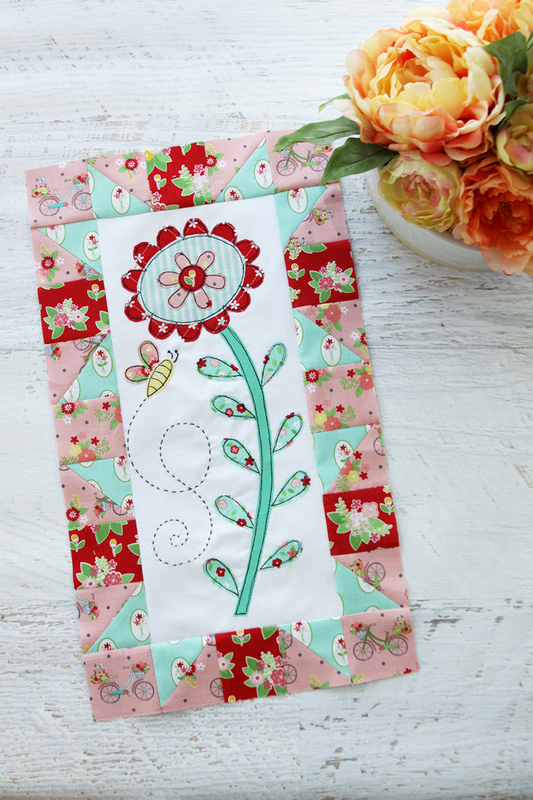 Her grandmother hopes to win this 4 quilt–save the bees! Years ago on HGTV they had one called Isabell’s Garden … it turned into a beautiful baby quilt and I saved it for my first grand, yes it was a girl! Your fabrics are so sweet! I have participated in 3 or 4 quilt alongs. They are always a great learning experience. Yes I did a quilt along. This year I’m doing the Quilters Planner quilt along. I have not done a quilt along, but have done many a craft class over the years. The fabrics are adorable! I’m trying to finish three quilts right now or maybe I would do this one also!! One is for a granddaughter….due any day now!! I start quilt alongs all the time! Or plan to, but my favorites are mystery quilts. No I have not participated in a Quilt a Long. I do love your Bee Block!!!! I have not thought about appliqueing like that. I have a hard time resisting the urge to join in on new quilt-alongs. Your fabric looks delightful in this block! One of my first quilts was a non at my local Bernina store. It’s still my favorite quilt. Thanks for your helpful hints. No, I’ve never done a quilt a long. I completed “Be my Neighbor” with Pat Sloane. I love the quilt. I’ve done a quilt along before but not online. I am getting ready to do a quilt along for The Farmers Wife, 1920 Quilt Sampler. I was working on some of the blocks through a class at my quilt store which had ended when I found a quilt along online. Although most will be doing EPP, I will use my sewing machine for piecing. It’s going to be interesting doing both of these, but this one is much shorter than The Farmer’s Wife. So cute–love your choice of fabrics. I have never done a quilt along before but would like to in the future. I have never done a quilt along unless doing a mystery quilt counts. I finished the quilt top, which is about full bed sized, but have not finished the quilt yet. Yes, i have done a christmas quilt along, and a valentine quilt along, and several mystery quilt alongs. Haven’t done a quilt a long yet. This is very fun! This isn’t the first time doing an online BOM. I’ve done several quilt alongs, including Jacquelynne’s Maggie’s First Dance and I Love Home quilts. I LOVE her QAL’s! I’ve done several QAL’s but I usually don’t make it to the end. But!, I’m determined to finish this one with everyone else. And I adore your fabrics!!!! I have never done a quilt along. I work full time and in afraid of falling behind and missing somet the farmers wife but big to chew off for your fist one haha. I did my first QALin 2012 with Aiming 4 Accuracy. Crazy fun, made a full size quilt which I later gifted to my granddaughter. I have never done a quilt along. I’m excited about this BOM. Super cute block, love your fabric choices. I have never done a quilt along. This is my first. I have done many QAL. I have made wall hangings, table toppers, and quilts. I recently started doing quilt alongs in 2018. So far I have created 3 quilt top challenges from the National Quilters Circle, Oda May’s Summer Camp through Moda. And I am still doing Moda’s Blockhead’s 2! I have got a quilt a long at the moment but I do it sporadically as it is EPP and while relaxing it doesn’t grow very fast! I have signed up for this but not the original fabric. However, I have fallen head over heels with your adventure fabric and bought a yard of every pattern and colour. It is just so beautiful I really love working with it. I have become hooked on quilt a longs. I am doing to right now. I have done several BOM and Mystery quilts. Most have ended up being queen size quilts. The most recent was the Lexington Sampler by Susan Guzman. Before that I did Bonnie Hunters On Ringo Lake. and I am currently doing a Mystery Quilt by Lisa Capon. I did the last quilt along that Jaquelynne Steve’s did! It was so much fun and I love the quilt! I am looking forward to this one! I once did a mystery quilt, quite fun watching it grow! I never did a BOM before and I am looking forward to the patterns for the blocks. “Save the Bees”: we all know that the bees have it very difficult at the moment. That is the reason why I want to share this BOM. I have never done a quilt sew-along. I’m already involved with a mystery QAL this year and it has been great fun. I prefer to select all my fabrics and colours first, so it’s also been quite a challenge. I’ve selected my fabrics for Save the Bees, so I’m raring to go. Your colours are cute and I love the free motion raw edge appliqué. I’ve done BOM and the like. Have a box of quilt blocks to make a quilt from same. Never really did a Sew-A-Long to put them together. I’ve made other quilts that weren’t sew-a-longs nor BOMs. Never have done a BOM quilt along, this is going to be an adventure for me just trying to keep up! Love your fabric line, love the one with the bicycle!!! Looking forward to this Quilt Along! I have never done a quilt along…this one is tempting me though!!! I have done a couple of quilt alongs but not for a while. This is such an adorable pattern I’m going to join in! I love your choice of colours, such a sweet quilt. Definitely going to be following along. I have never done a quilt along although I have admired some. I hope to complete this one. This is my third and it is really cute, can’t wait to get started. I love your selection of fabrics and your block turned out very cute. I have done several BOM’s but lately have not had time for very much sewing. Life kinda gets in the way…..
Just completed the 2018 NQC Challenge. No I never done a quilt along before but this one looks fun. I have never done a quilt along. Sounds like such a fun new adventure in quilting! Love the bee!! Never participated in a quilt a long!! Fabric is super cute!!!! Finishing up my very first quilt! This is on my ‘to do’ list for second attempt! Adorable block!!! I love QAL – I’ve done the Tula pink 100 days and several mystery quilts – sew much fun!!! I love QAL’s-what an amazing way to learn about how to quilt, by doing & learning! Looking forward to this cute block! I love QALs. My favorites are appliqué and mystery quilts. Thank you for sharing this with us! I have participated in several BOMs. I’ve never been in a sew along before as I’m on a fixed income & usually can’t afford all the material. But this is one I’m gonna try to complete as I’ve fallen in love w/ this one. I have had many good intentions regarding QAL’s and also BOM’s! I have lots of downloaded patterns stored on this computer but have yet to finish an online event! I hope to make this my 1st completion of many! I’m leaving for 10 days in AK in just a couple days so I have to wait until I get home to start!! Years ago I participated in a QAL that was a mystery quilt. I was looking at that quilt yesterday and thinking how much I like it. It was a new experience for me, not knowing exactly what I was making, but I did enjoy it. I am presently doing the Splendid Sampler 2 and I also did Jaquelynne Steve’s QAL two years ago. Looking forward to this QAL. Your block is beautiful. I have not joined an online group before, this looks like fun. I have never joined in on a quilt-a-long and am super excited to be joining Save the Bees! I love nature and bees are a vital part of our life. I really love the color palette you used! I have entered a few quilt alongs and some mystery quilt alongs. I seem to fall behind because I try to do too much at one time. I do follow online and print the patterns so I can finish them at my leisure. I love to learn new techniques and am loving discovering these cute as pie blog sites. This Bee pattern was much too cute to not participate. Thank you! Yes, I have participated in several “quilt along” projects. That is the way I learned new skills and have fallen in love with quilting. I made Jacquelynne Steves first quilt along and my sister has it an loves it. I’ve done round robin quilts before but this is my first online quilt along. I love seeing everyone’s blocks! This is my very first sew alone! Im so excited to be finally doing a bom!!!! Love the reds you chose! Your block is so cute! I love your fabric, too. I’m in the process of a Jinny Beyer mystery quilt. I did “The Patriot” quilt-along with AlyciaQuilts (a QOV), and a hand piecing project from Inklingo. I’m always chomping a the bit to move along, and then get distracted. Any direction, quilting calls my name. I love blocks of the month, or sampler quilts, more inviting to the eye. You have used beautiful fabrics. I am looking forward to the new book!!! I have never done a quilt a long but I am looking forward to this!!! Not yet. I have done a couple of BOM’s. This is my first quilt along! I’m looking forward to seeing what others create! No, I have never done one, so I am excited about this one! I did my first quilt along more than 30 years ago – and have continued to participate infrequently over the years -excited to get back in the swing. This is my first online quilt along. I completed one Block of the week through my local quilt shop and that quilt now covers my bed. Yes, the first quilt along I tried was one with Jacquelynne Stevens! I have participated in several sew or quilt a longs. It is so fun to see what everyone else is doing. I am always so amazed at how different each quilt or pattern looks in a sew a long. I love them. OMG soooo adorable! I’m making it for my mom she loves ! I haven’t done a quilt along yet. Hope to when I retire! I have done several quilt alongs I love seeing the variety from a single pattern. I have done a quilt along (Grandma’s Kitchen)–am still working on it. My first and only quilt along was last fall when I did I Love Home. I have never made a quilt along. I would be excited to try it. I have done several mystery quilts and BOM – mainly through Facebook groups. Thank for the the chance to win. Only once… a wall size quilt where each block was learning a new type of piecing. So it was a fun experiment! I am looking forward to this one. And your blog looks SEW fun!!! I have never done a quilt along and I am so excited to do this one! Seeing all the different fabric choices is so fun!! No I haven’t and I am excited to get started. Yes. Last one was from Australian Homespun mag by Natalie Bird called Foxley Village. Your Quilt block is adorable!! I am going to jump over and join!! I just the fabric design!! But RylieBlake is the best!! I have never done a quilt a long before. But it sure looks fun!! I’m a beginner and never did a QAL, but this one I will because it will be a gift to a little girl who plants flowers to Save the Bees. Love how you mixed the had embroidery with the machine appliqué. I am GREAT at STARTING Quilt-A-longs… need to finish! this one looks so fun! I am enjoying seeing everyone’s versions. They are all lovely! I have never participated in a quilt along before. I’m excited to participate. Your block is pretty! I have done a couple of quilt alongs. One was for a garden & sewing theme blocks. I never made the quilt, but used some blocks to make sewing machine covers. I also did a Tea themed sew along with Jacquelynne Steves and her house one too, but never finished those either. I guess I just liked making the blocks. I should get those finished! I have several quilt-alongs going at the same time. The last quilt in a quilt-along I finished was called “I Love Home”. I have not actually participated in one, but I have followed along on many with good intentions of joining in. Every time I wanted to start one, something got in the way. I have not done a quilt a long. I had never done one until this year. I started two in January and now two this month. There is a snowman quilt, a Murder mystery quilt, fun on the farm and now Save the Bees. Je n’ai pas de courtepointe et je visite le site pour la première fois,je trouve le concept intéressant et serai ravie de pouvoir participer même si mon niveau n’est pas celui d’une professionnelle. I can’t wait to start . I will be doing it with the Vintage Adventures line. This is my first! Exciting!!! I have never done a Quilt-A-Long… never done a quilt for that matter! This will be my first attempt at quilting! So excited! I have never done a quilt along. Thanks for sharing. No,it’s the first time and i love the projects of Jaquelynne Steves! I have never done a quilt a long. I’m so excited for this one! This is my first quilt a long and I am very excited about it! I love this first block!! I have done the I Love Home quilt along. This will be my first BOM quilt along. I am looking forward to the fun we will have sewing a quilt together. Love your fabric choices. This bee block is so much fun. Yes, I have done several quilt-a-longs. I really enjoy doing them and learning something new all the time. I am looking forward to this Quilt-a-long! Should be fun! I’ve never done a Quilt a long. I seem to always have other projects that need finishing. Great tutorial! Love the fabrics. No, this is my first quilt along. Yes, I am participating in a few right now, but since this is my first year doing this, I’ve not completely finished any of my quilts yet. I have finished all the blocks for 2 of them, but I still have to put the blocks together and quilt them. They are so much fun. Glad to use some of stash. Ready. I have done–well started the first Farmer Wife’s Sampler. My sewing time was promptly diverted and then fell off almost completely after my first husband passed away. Well, kind of…. I started the original splendid sampler, made about 30 blocks and got inundated by life. Plus I’m easily distracted with new projects… . i think this Sampler will be small enough for me to finish!!!! Have done several quilt alongs within our quilt guild. This one looks like fun. I have never done a quilt along. This will be a grand adventure! :) Thank you! Yes I have….just finished the Sewing a Village quilt along with houses that people all across the country participated in. I loved it! 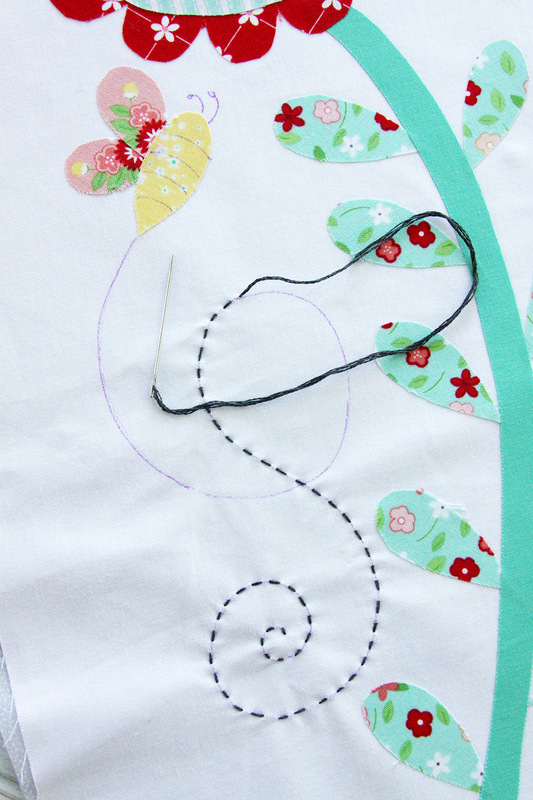 I am doing a see along now, the Kingfisher quilt sew along is ongoing and I’m loving the process. This will be my second sew along. I like the way you stitched on your appliqued pieces. I think I will give this a try. Thanks for sharing your pictures. I have never completed a quilt along, though I have started several. I recently started my first quilt along; mystery blocks for a quilt with Sherri from aquiltinglife. Your block looks so cute in your fabric! I have not done a quilt a long but I have done a lot of knit a longs. I’ve never participated in an online quilt along before and am really looking forward to the fun! Ive never done a quilt along, but have done mystery quilts. I have never parcipatedin a quilt along. I am very excited to do this. I participated in the Splendid Sampler sew along. It was fun to see all the different color combinations people used in their blocks. This is my first experience with anQuilt-a-Long! I am enjoying it so far and love to learn new skills as we do each block. Yes, I did a quilt a long with Alyssa Thomas from Penguin & Fish. It was the last Jacquelynne Steves BOM, “I Love Home”. My first quilt along was Pat Sloan’s first splendid sampler. Hi. Yes, I’ve done a quilt along and a sew along. The quilt along was the Grand Illusion quilt with Bonnie Hunter a few years ago, and the sew along was an Art Portfolio by ModKid hosted by Alyssa Thomas. This is my first quilt along and I’ll be using mostly scrappy fabrics. I have never done a quilt along. I’m loving the different fabrics that are chosen. This will be my first one…looking forward to the journey! I have never done a quilt along before, but I’d like to. Thank you for the opportunity to win this book. I have done two in the past. A girlfriend and I would drive 1 hr to Palm Springs each month. I am not sure if I had more fun with the quilting or the visits there and back. Either way, one grand baby uses the 30’s print quilt I made and my parents have the other quilt I made through these classes. Super fun! I have participated in several quilt alongside and find them to be very fun. Your block turned out beautiful. I mean quilt alongs I am writing this on my phone and auto correct changed it. My first QAL in 2012 was for beginners and each block taught a new piecing skill. It was a great introduction to quilting. This fall qal is only my second one The other one was last year’s holiday qal. I’m enjoying seeing all the different choices of fabrics and applique techniques. Looking forward to this quilt along because I’m in a group Bee Hive and I am doing my quilt in colors similar to yours. I’m usually a couple of years behind in quilt alongs. I just save the patterns and file them. When I am ready to start a new project, I brouse my files. This is my second quilt along. First one I did is I Love Home with Jacquelynne Steves. I loved every minute of it! Sew here I am doing it once again!! Looking forward to quilting Save the Bees. The only quilt I have finished is twin size for my granddaughter. great colors for your design! so much opportunity tobe creative!